Funny thing is, the old Mario movie was originally meant to BE this sort of loyal adaptation. We just need something on the level of Wreck-it Ralph exept with Mario characters. Appropriate, given that Ralph is basically Donkey Kong (Cranky Kong as a young man) in human form. But I'm now picturing a Mario movie movie with Sonic/Pac-Man/whatever cameos. Didn't they say they wanted to give Mario a role in Wreck-it Ralph 2? I think they wanted to give him a role in the first movie as well. But couldn't find a good use for him that didn't underuse his character. Yeah I heard that too but I believe they said something like they'd try to find a role in the second one. In an interview last year, the director of the final SMB movie said the idea behind it is that it's the "real story" of the Mario universe and that the games are actually kiddified adaptations (as hinted by the post-credit scene). I don't know if I find it stupid or awesome. 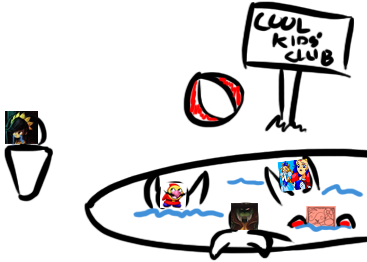 Come on in, Glowsquid, the water's great! BWAAAH HAH HAH! THE WATER'S GREAT, EH, JUNIOR! ?